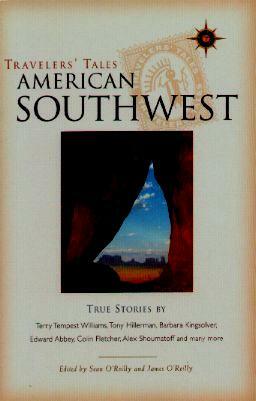 This is the third Travelers' Tales publication I've reviewed and I really enjoyed this collection of stories about the southwest. The stories are from people like Barbara Kingsolver, Alex Shoumatoff, Colin Fletcher, Edward Abbey, Aleta George, and Susan Hazen-Hammond, among others, all passionate about this most historic and harsh part of the world. Walking where native Americans like the Apache and Navajo walked, experiences abound of hardships of days gone by. Cliff dwellings, the pictographs on walls, the immense beauty of this region, the red rocks, the animals, the spirituality and ongoing life are just some of the topics. Whether on a tour or on foot, or alone, we get enormous encouragement to get off our collective butts and get out and see what this planet has to offer. I read the first two sections, Essence of the Southwest and Some Things To Do, both of which I found enchanting and enticing. The other two parts, Going Your Own Way and In the Shadows I am saving for a later date. I live practically at the back door of the southwest (in southern Colorado) and am teetering on an adventure. I just have to decide exactly where I want to go. Conclusion - Highly recommended for travelers and non-travelers alike.